At the 2010 Commonwealth Games, the New Zealand netball team topped their pool with four easy victories and a 47–41 win over England. They then won their semi-final against Jamaica comfortably, while the Australian Diamonds’ five-goal margin over England in the other semi-final suggested they were a capable match for the Silver Ferns, their traditional rivals. Just how close the teams were became clear as the match, the longest official game of netball ever played, stretched over 84 pulsating minutes. The match was tight until the Silver Ferns led by seven goals early in the fourth quarter. An Australian comeback reminiscent of their surge to victory in the 1999 world championships final levelled the scores at full-time. There was still nothing between the two teams after 14 minutes of extra time. Under a rule which its drafters surely never expected to be needed, play would continue until one team was two goals ahead. Both Australian shooters missed their chance for glory; Maria Tutaia did not, and the Silver Ferns won 66–64. The epic victory won New Zealand’s second consecutive Commonwealth Games netball gold medal and matched Australia’s triumphs in 1998 and 2002. The balance has subsequently shifted once again. 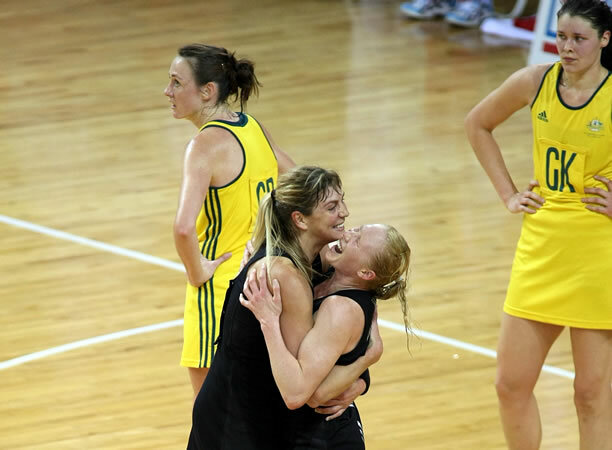 In 2014 the Australian Diamonds thrashed the Silver Ferns 58–40 in the gold medal match. In 2018 the New Zealanders failed to reach the final for the first time and were beaten 60–55 by Jamaica for the bronze. It was scant consolation that the Australasian duopoly was broken when Helen Housby scored in the last second of the final to give England a one-goal victory over Australia. We have 15 biographies, 9 articles, related to Silver Ferns beat Diamonds in Commonwealth Games thriller.